In the past month or so I’ve been bombarded from every media outlet by images of beautiful Capri. So it got me thinking about my trip and adventure to the beautiful island. I visited Capri a couple of years ago, before I had any inclination of writing a blog about my Jaunting Trips. It was part of a longer trip around the South of Italy. My jaunting partner, Vicky, and I planned an extensive route that included Rome, Amalfi Coast, Bari and ended up in Lecce, at a friend’s wedding. In retrospect, if I knew the beauty that we were about to witness, I would have given Amalfi Coast and Capri at least an extra day. It is one of the most beautiful regions I have visited until now and a couple of days are just not enough. We wanted to make this a 100% Italian trip, so we planned for a Fiat Cinquecento as a rental car. But low and behold, when we registered in Rome for a car and said we were heading South, Fiat 500 was off the table. We ended up having to settle for a Lancia Ypsilon, because it’s apparently less likely to be stolen. What can I say… and encouraging message at the start of our trip. 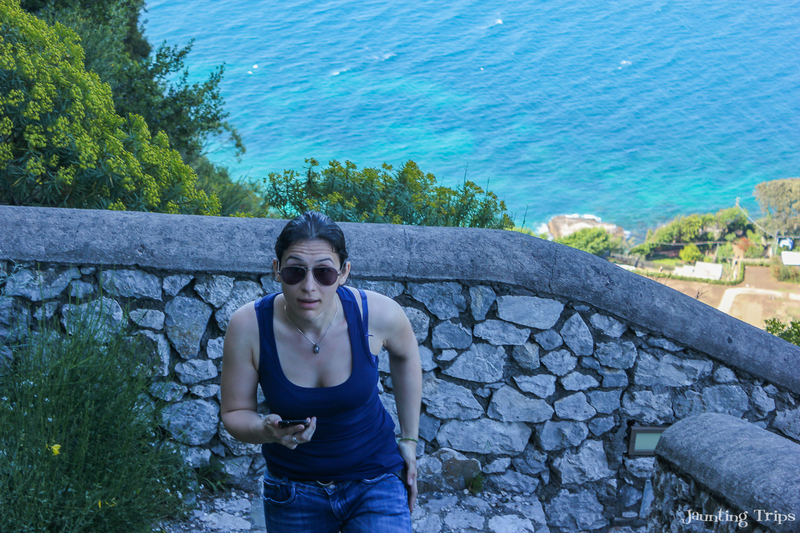 For some reason, Capri was not on our initial road trip plan. But on the evening we spent in Positano we decided in the spur of the moment to go for it. 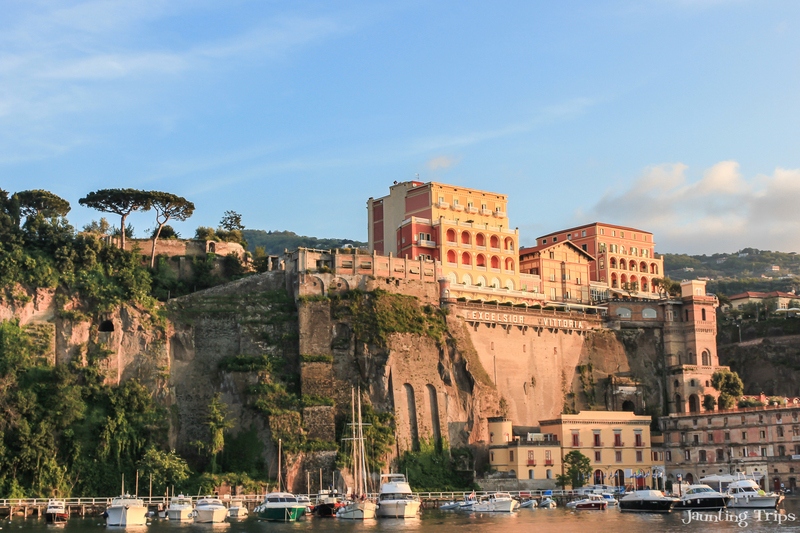 The next morning, we jumped in our little Lancia and headed out to Sorrento, from where we would catch the ferryboat to the island. You can spend the whole day exploring Capri, but keep in mind that the last ferry leaves at 18:45. The schedule information is available on capri.net. A round trip will cost you around 50€ if you book it online (there is a booking fee of 12€), but you can also find tickets directly in the port. Just make sure you get the return ticket from the start so you won’t stress about missing the last ride off the island. The trip from Sorento to Capri takes about 20-25 minutes, and the ferry will drop you off in the main port of the island, Marina Grande. The two towns on the island, Capri and Anacapri (that literary means “above Capri” – however… I would discover its meaning later) are absolutely charming, with lots of small boutique shops, restaurants and art galleries. 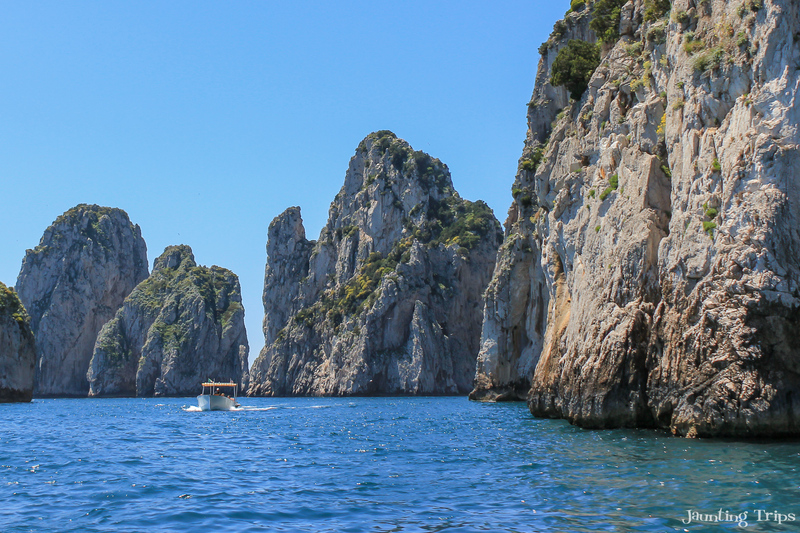 But you can’t experience Capri to its fullest unless you take a boat tour. 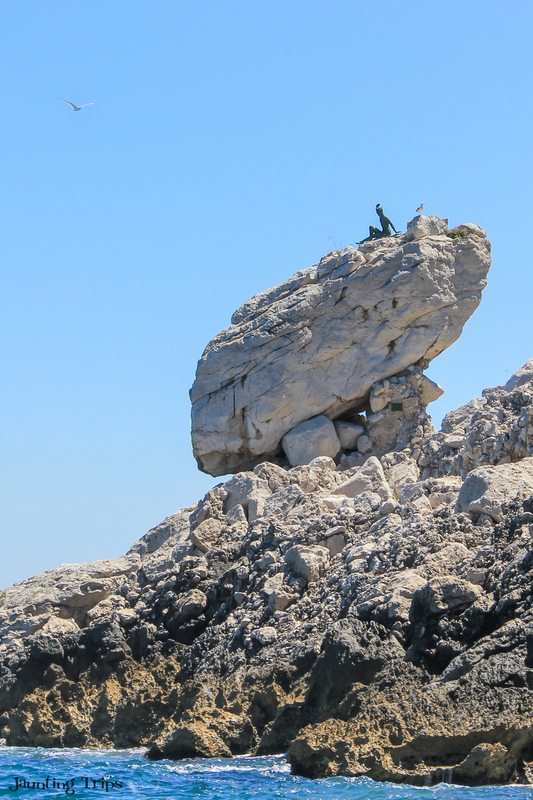 I highly recommend getting the full island tour, not just the Blue Grotto, because it’s really worth it. The views are absolutely stunning! 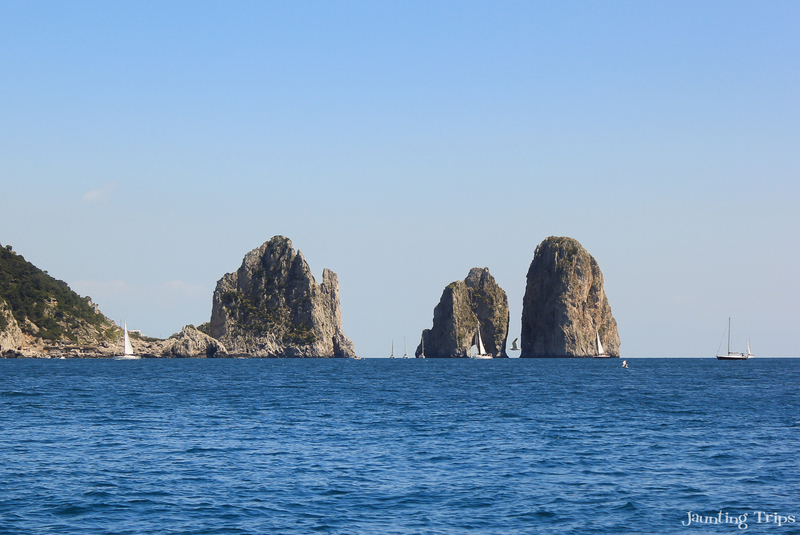 The tour starts from Marina Grande, where you can choose between two operators: Laser Capri or Motoscafisti di Capri. They offer more or less the same packages for about the same price. The whole island tour is 18€, but depending on when you book your trip, you might get a little discount. Of course, you could go for a private tour, but that will set you back a few hundred euro… or more. Depends on the size of the yacht and how much you really want to spoil yourself. But sticking to the regular tour… Leaving Marina Grande, you are first greeted by the bronze statue of scugnizzo Gennarino. He is waving to the visitors coming and leaving the island. Don’t forget to greet him back with a strong “Ciao, Gennarino!” for good luck. The next stop is the massive Tiberius’ Leap (Monte Tiberio). Capri was Emperor’s Tiberius favorite retreat, and Villa Jovis, on top of the cliff, it is where he spent the last years of his life. According to the legend, as paranoia took over, Tiberius’ Leap was the place where the Emperor pushed off the cliff unwanted guests or disobedient servers. Following Tiberius’ Leap of doom you will start visiting the caves around the island. First one is the Coral Grotto. There is only room for one boat at time, so you will have a small line of boats forming, depending on the traffic. The next stop is the White Grotto (Grotta Bianca) that is flanked by large stalagmites and stalactites. One of them actually resembles the statue of Madonna, but it’s a bit tricky to photograph. 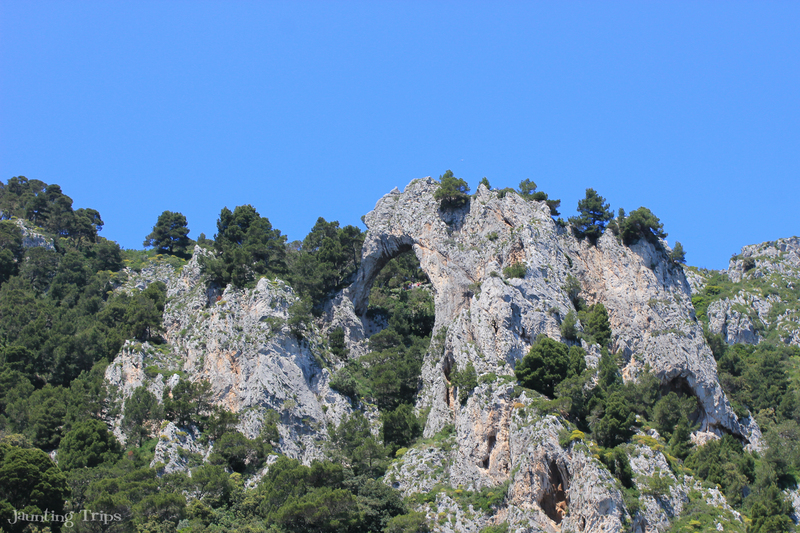 Also, if you look up, from the same bay, you will be able to spot the Natural Arch (Arco Naturale). 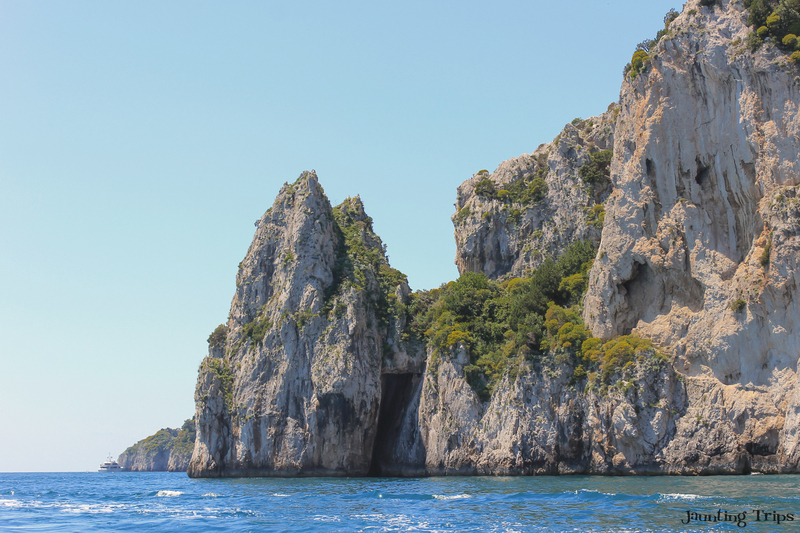 Sailing away from the shore and the caves, the boat will take you to the Faraglioni – the three rocky giants that give Capri its unique look. The interesting fact is that they have actual names: Stella (the one still attached to the island), Faraglione di Mezzo and the farthest one, Faraglione di Fuori or Scopolo. If you want to enjoy a day in the sun with a great view of the Faraglioni, then I suggest you take a break in Marina Piccola Bay. Being on the sunny side of Capri, this former fishermen village is now the place relax in the lounge chairs, enjoy a cocktail with a view and maybe let yourself be seduced by “sirens” same as Ulysses. 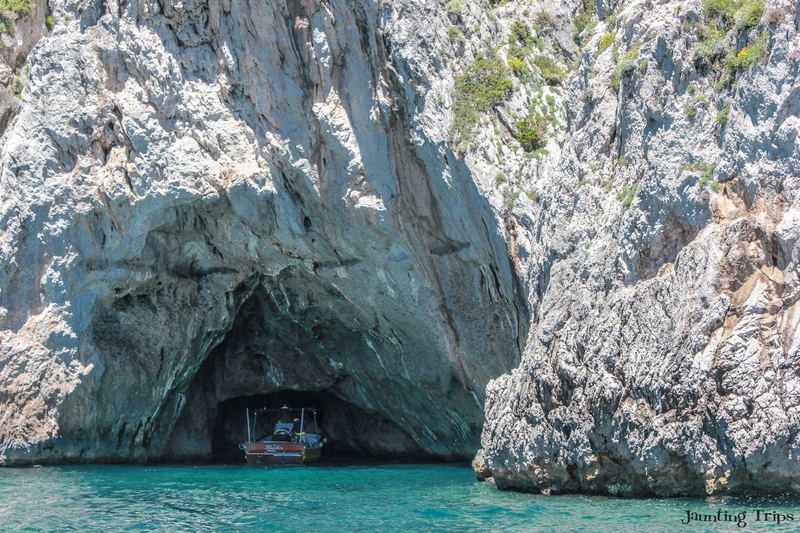 Passing Marina Piccola and the Sirens’ rock, you will visit another beautiful cave, the Green Grotto. The light falls on the water and reflects these beautiful emerald green tones that give the grotto its name. I hope the pictures sparked your interest in experiencing this tour yourselves. I mean what’s not to like? 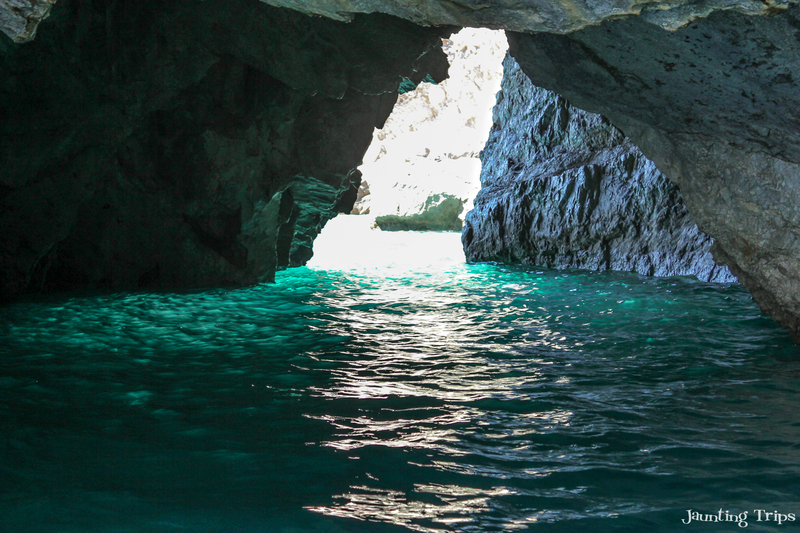 Riding a boat, wind in your hair, beautiful scenery, amazing colors… And speaking of colors, the last stop on the tour is the Blue Grotto (Grotta Azzura). The entrance fee is not covered by the tour. So if you want to visit, you have to pay separate at the entrance an additional 14 €. 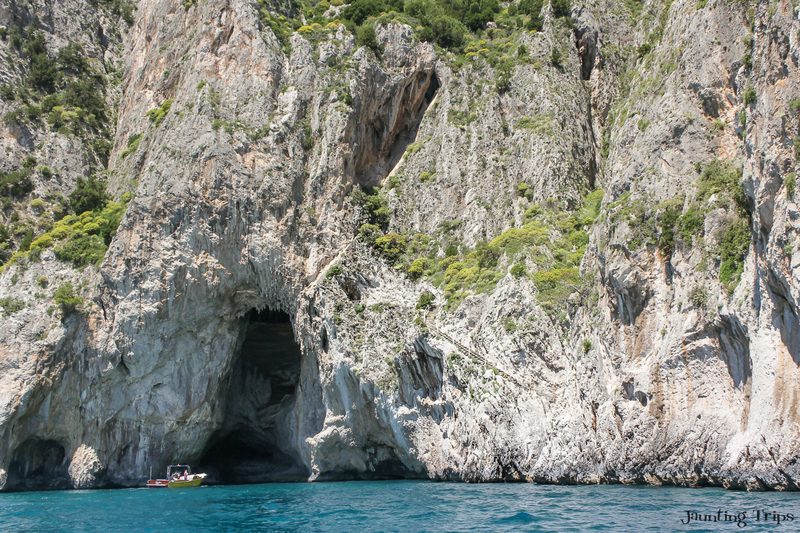 The access to the grotto is made via wooden raw boats through a small opening. So when the captain says “duck and keep your hands near your body” that’s what you do! Not much time to think or negotiate your approach. Just lay on your back, hands close to your body and you’ll squeeze through. 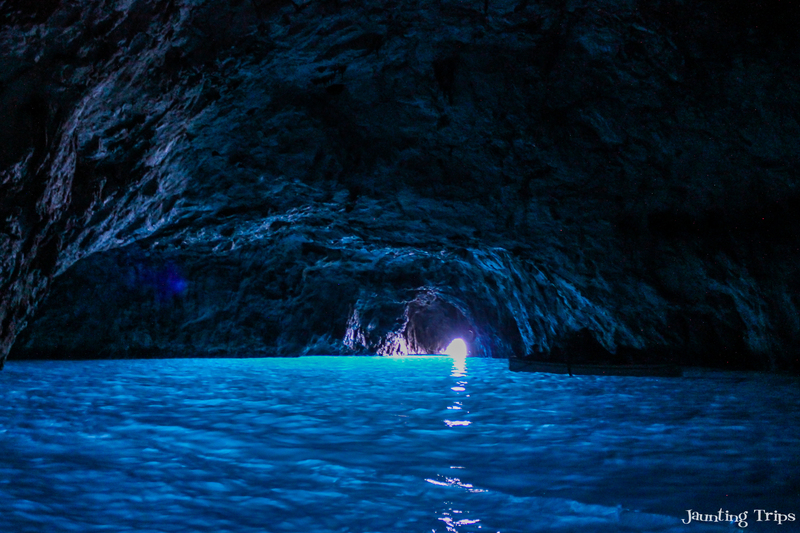 Once inside Grotta Azzura, you’ll be enchanted by the most beautiful shades of blue you can imagine. The small boat will circle the cave, then you’ll be on your back and out to the sea again. After we finished the island tour, the boat brought us back to Marina Grande. From there we decided to go to the center and explore. We checked the GPS – 1.7 km to the center. That’s not far – I said – let’s walk it, enjoy the sights. We looked around for the path on the GPS and we concluded the stairs were the way to go… I mean 1.7 km, that has to be somewhere beyond those trees. Well what the GPS failed to mention, and due to my complete lack of research I had no clue about either, was that the 1.7 km were actually vertical. City center… sure just beyond these trees. I mean how long is 1.7 km walking distance? What? It’s not my fault! It’s the GPS… Damn you GPS! You see my surprised look? Yup that was when I realized that the bridge we were seeing from the bottom was not our stop… we were going even higher. Needles to say that we were the ONLY ONES going up. We had a few people walk by… going down, probably wandering who are these two masochists going all the way up by foot. 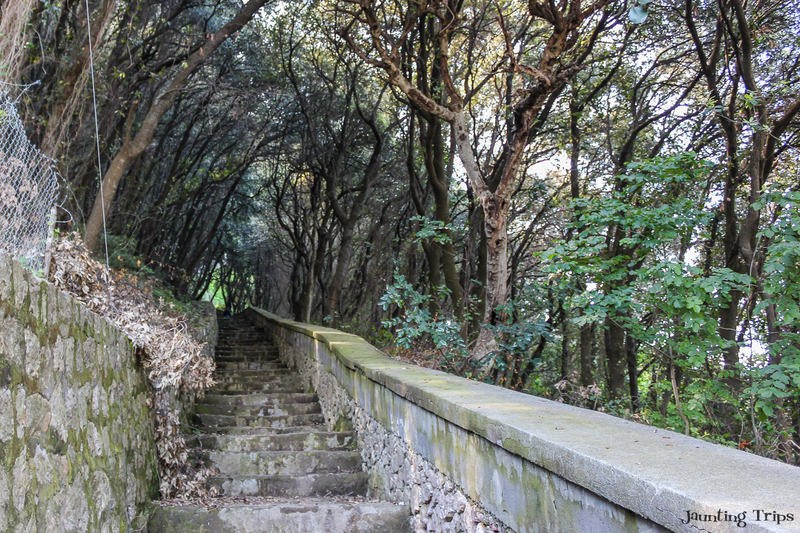 921 steps later we climbed the Phoenician Steps and reached beautiful Anacapri. Despite an extensive unplanned workout and some definite muscle soreness for the next day, we did get to enjoy one of the best views that you could experience in Capri. Bonus at the top… we scarfed down some gelato like there was no tomorrow. Of course there are other ways to travel on the island without killing yourself. For getting to Capri you can take the cable car or the bus for 2€, as for Anacapri there is a bus line from both Capri and Marina Grande, for the same price of 2€. Phoenician steps – 921 to be more exact, but what a view! Due to our “extended” trip going up the stairs, we didn’t have enough time to explore as much as we wanted to. There was a bit of pressure to get back to Marina Grande and catch the last ferry back to Sorrento. No way we were walking back down. So we decided to get in line for the bus, but time was ticking and the line was too long. A mini panic was starting to take over, so the other option was to take a convertible taxi. The price is a little steep – about 20-25 €/ride. However, it gets divided among the number of passengers (you can fit up to 4 people), and it will get you down on time to Marina Grande. 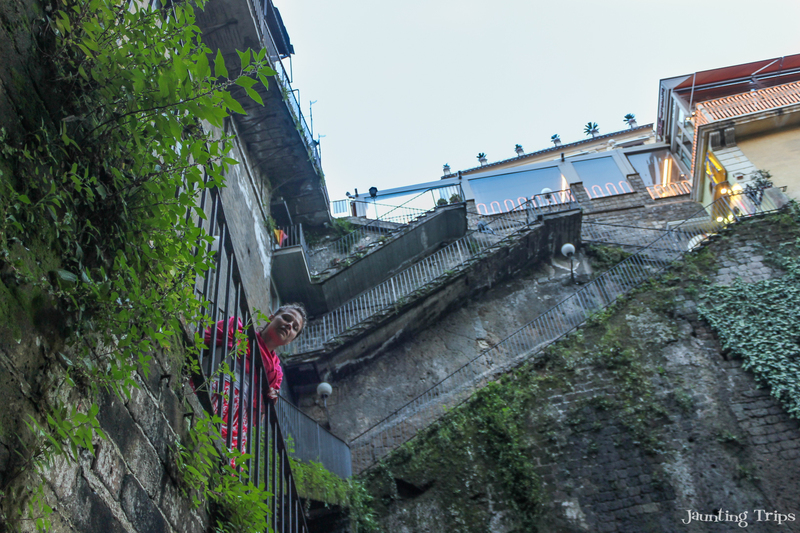 We returned in Sorento just as the sun was setting and we closed the day going up one more flight of stairs, because… why not. By now we could call ourselves “experts”. Since this is Amalfi, on our way back to Positano, we decided to stop at a hotel with a terrace for a late drink and a night view of the coast. It was a pretty exciting adventure with some amazing sights to see, a little bit of workout and a lot of sunshine to remember! And the crazy thing, I’d probably do it all over again… even the stairs. The view is worth it 100%! Rent a small car for driving the Amalfi Cost. The roads are narrow and the parking spaces are difficult to find. 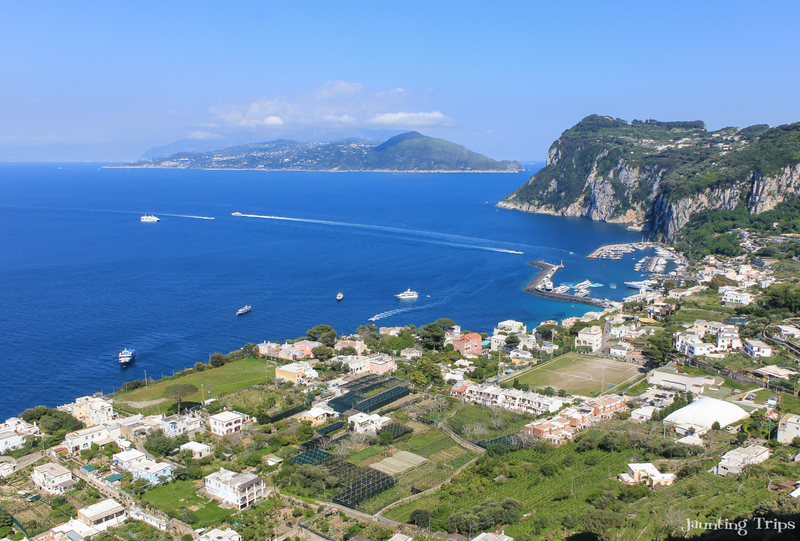 Book your return ferry ticket for Capri from the start, so you don’t miss your last ride off the island waiting in line. Take your time and stop for a drink or a snack. Enjoy the view from one of the many terraces/restaurants on the coast. I visited Capri a few years back and these photos really transport me back to my memories. Those steps were killer! I always hear about the Amalfi Coast and have always desired to travel there. I will definitely add Capri to my wishlist after reading this post. Especially since it seems less crowded and still has the same picturesque views. I went there at the beginning of May, so that was in my opinion a good period. Not to hot though, so probably swimming is out of the question, but for visiting it’s ideal. It was not that crowded, and you can really enjoy the island and not have to squeeze between tourists. I hate when weather screws you over. It happened to me in Malta, and sadly now, there is no more Azzure Window. So you should definitely go back. The colors are spectacular to say the least. Gotta love those spontaneous adventures. And 921 steps?!!??!??!?! You sure got a good workout in that day! Those views are definitely worth it tho. In fact, I’m gonna add it to my list for when I get to visit Capri! Thanks for sharing!! Yup that’s how it went down.. or better said up :)) But like I said, I’d do it all over again. And I would take 2 days to visit Capri, just so it wouldn’t feel rushed. This place sure looks beautiful! Loved the sea caves. This looks amazing! Capri is on the top of my list of places to travel! All the pictures I see are completely breathtaking! Thank you Christine. It is indeed an amazing place to go. The whole Amalfi Coast also! It’s one of those places that pictures don’t make justice! 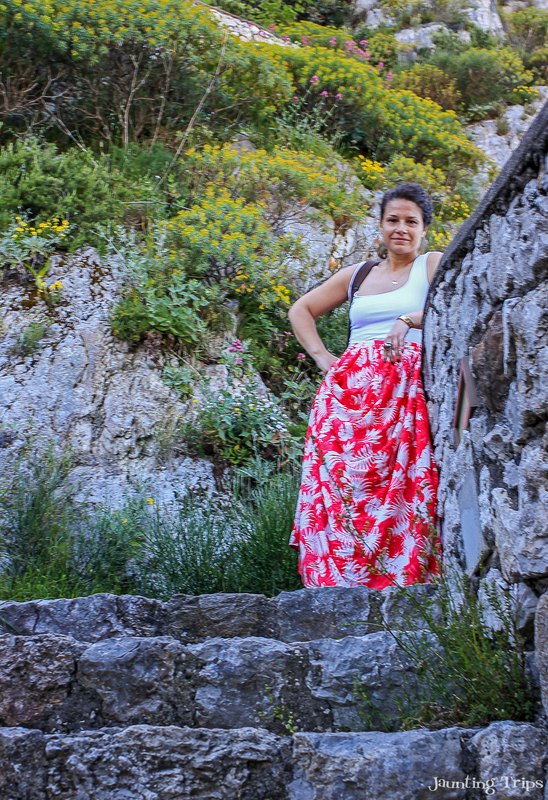 I absolutely LOVED Capri and southern Italy! I’m going back next month to visit northern Italy and can’t wait! 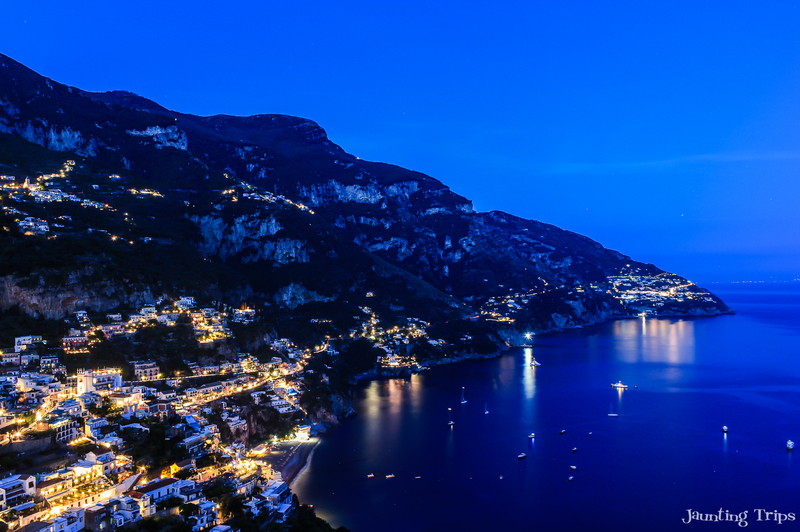 Your pictures are so nice, they make me want to fly over to Capri right now! 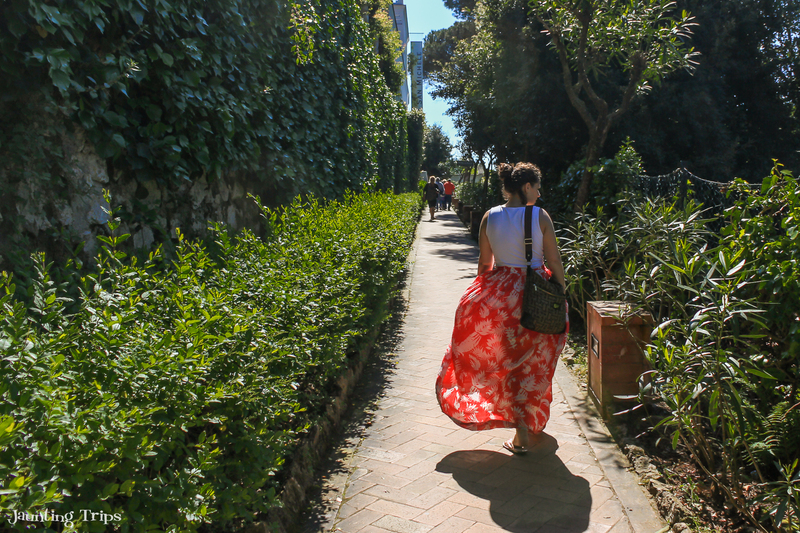 And oh boy, do I feel your leg pain – reminds me of when I climbed il Duomo, Campanile, and then walked all the way to Piazzale Michelangelo in Florence! Anything for the views! Thank you Radhika! I am looking forward in setting a trip to Florence. I have stairs training form Capri and Paris (Notre Dame). This post QUITE LITERALLY comes at the perfect time! I’m currently planning a trip around Italy and really wanted to get to Capri but wasn’t sure about the timing and if one day was enough. Your post touches on all the questions I have – and has some gorgeous photos to coincide! Last October we were in Naples for a day when our cruise docked there! We were so confused between Capri and Amalfi coast as both were, ofcourse, picture-perfect options to consider and we had time for just one! We ended up doing Amalfi but seeing your pics, I know I am going to do Capri someday when I am back in Naples :)…. Well.. can’t blame you. Difficult choice for sure, but for sure none of them wrong. You could go either way and not regret it. Just have to make time for the other. Just the article I wanted to read. I am currently planning my own 100% Italy trip for next year. I didn’t think to add Capri to the list though. After reading this, I am for sure going to book a ferry there. Ah wow it looks so perfect and the caves look amazing inside. Definitely on the bucket list now! We are thinking of getting a ferry from the North of Italy to Sicily and working our way back up. Hopefully, we can stop here! If you could stop it’s really worth it. Capri looks so stunning! Especially the Blue grotto! 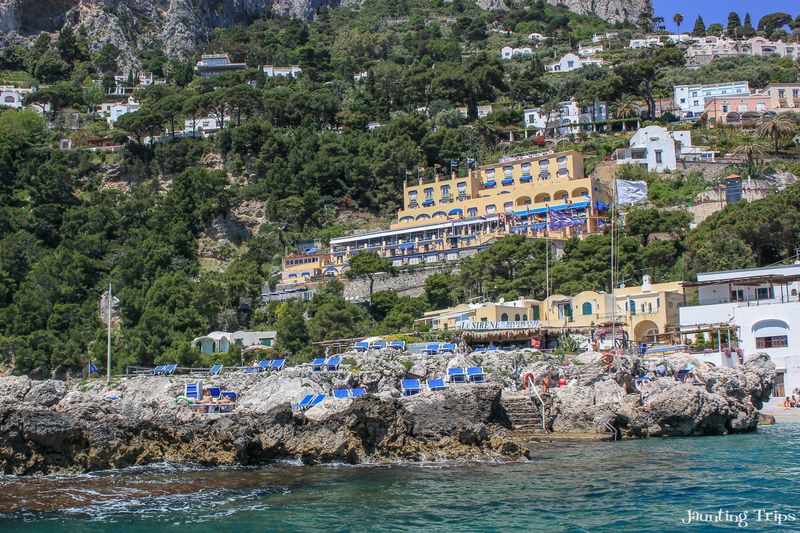 This is such helpful info and I will definitely be bookmarking it because I want to head to Positano and make a day trip there! Positano was amazing also. You should definitely save a day for Capri. This sounds like an incredible trip! 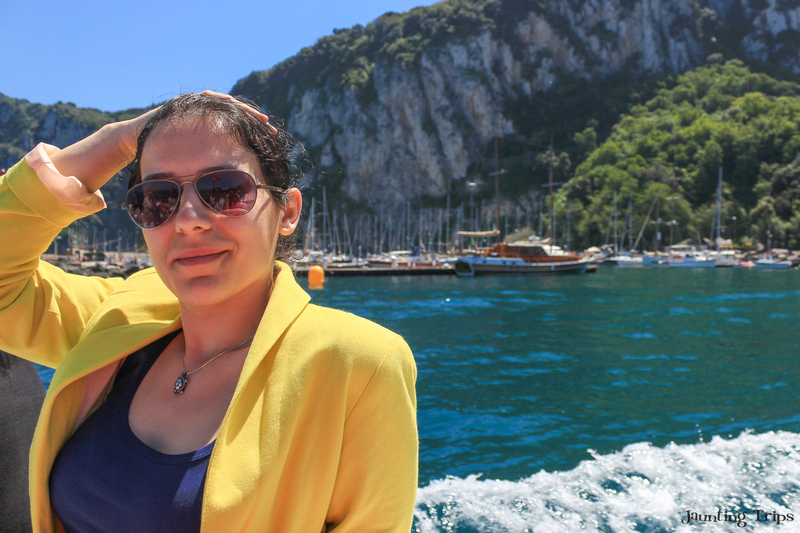 I visited Capri years ago when I was in Naples, and we had an incredible experience. I’ve always said that I wanted to go back, I’ll definitely be bookmarking this to help me plan my next trip! I know that feeling. I’m going to try and go again for sure. It’s one of those trips that you have to do again!